It’s no surprise to find that this is music recorded for a video installation. It has more of the air of an exhibited piece, a gallery experience than a musical performance, and approaching this as a piece of sonic art is probably going to result in a richer listening experience – there’s a sense of a delicate sculpture being formed as seemingly random and/or non-instrumental sounds are slowly assembled, bolstered by occasional notes from Tilbury’s piano. To give an idea of the painstaking and unhurried approach, we’re a full six minutes in before the first chord… and it’s a fair while longer before the second. 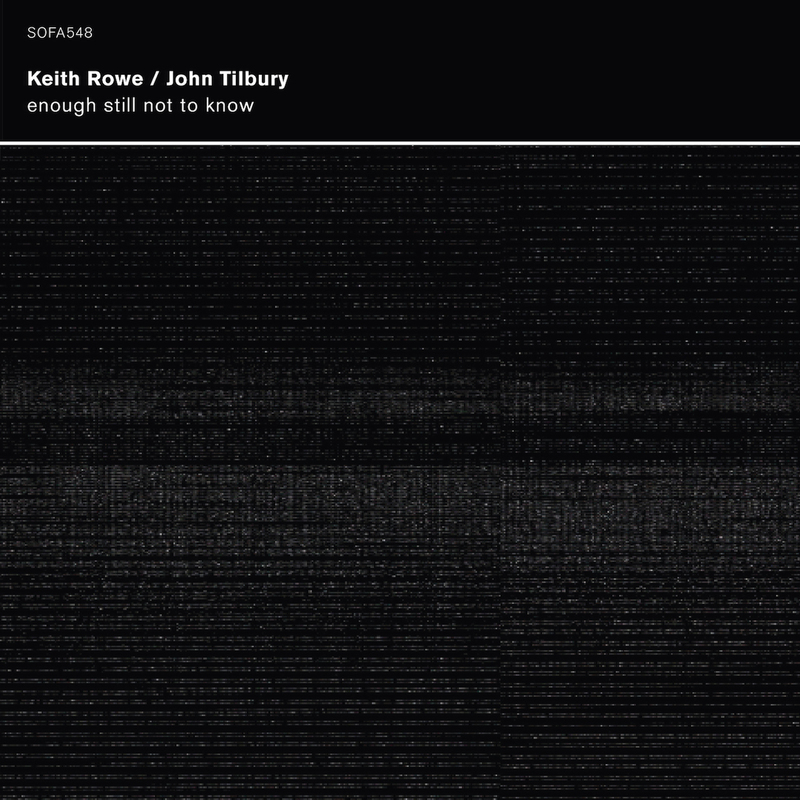 As one of Tilbury’s isolated phrases in the liner notes says, “We did not know at the time that it would or might be released on CDs.” Intended to accompany Bjørgeengen’s flicker videos (hence his producer credit) this was not originally intended to be heard without the visual element. However, here we have the pure sound, more than three and a half hours across four discs, being presented in the style of music. The question is, does it make the transition from one presentation format to another? By turns intriguing, serious, sinister, frustrating, suspenseful, demanding and quite beautiful, the answer is yes, it does – but being spread over four discs, it requires a little commitment from the listener. The press release references Rowe and Tilbury’s attraction to the works of Samuel Beckett, in which absence is as important as presence and the sense of events occurring off-stage or just out of earshot. It talks about “lacunae and elisions” and there’s no better description: this recording is full of unfilled space and endlessly varied abbreviated sounds; a series of holes which the listener must fill, in the same way that the eye creates colours out of Bjørgeengen’s monochrome videos. Or to put it more simply, this is a set of the free-est and least idiomatic sound I’ve heard for some time, possibly ever. Disc one is incredibly spare (plenty of those lacunae! 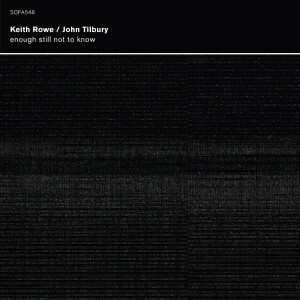 ), the sounds from Rowe are particularly indecipherable and fascinating, while the familiar tonality of the piano offers an anchor of sorts when Tilbury makes his unpredictable interventions. Disc two continues with more of the same while introducing some fresh sounds – zips? a distant radio news broadcast? – and at one point, what seems to be a duet of amplified paper tearing. Disc three gets emptier, with momentary instances of both menace and transcendence. Finally, disc four increases the density in a kind of culmination… some harsher sounds, more strident piano, higher volume, hints of eastern strings, more electronics… but still plenty of space created by virtual (and actual) silence. Often angular, enough still not to know is always surprising, sometimes jolting, constantly herding the mind in new and oblique directions. Taken as a whole, it’s the aural equivalent of being on the edge of your seat, almost desperately wondering what the next sound will be. The volume of many of the details (especially Rowe’s) is low. I don’t doubt that at some point, we hear a pin or two drop and headphones are ideal (or a very, very quiet room) otherwise you’ll miss half the details. Finnish experimentalist Erkki Kurenniemi composed according to a set of rules, the second of which was, “Consecutive sounds must be chosen so that they are totally inconsistent or surprising and have no rational relationship with each other.” As descriptions of this recording go, it’s as good as any and better than most.